My life is pretty plant-centered (no secret there!) so this year I decided to add live ornaments to my Christmas tree using a few succulents from my garden. (Don’t worry, no plants were hurt in this process!). 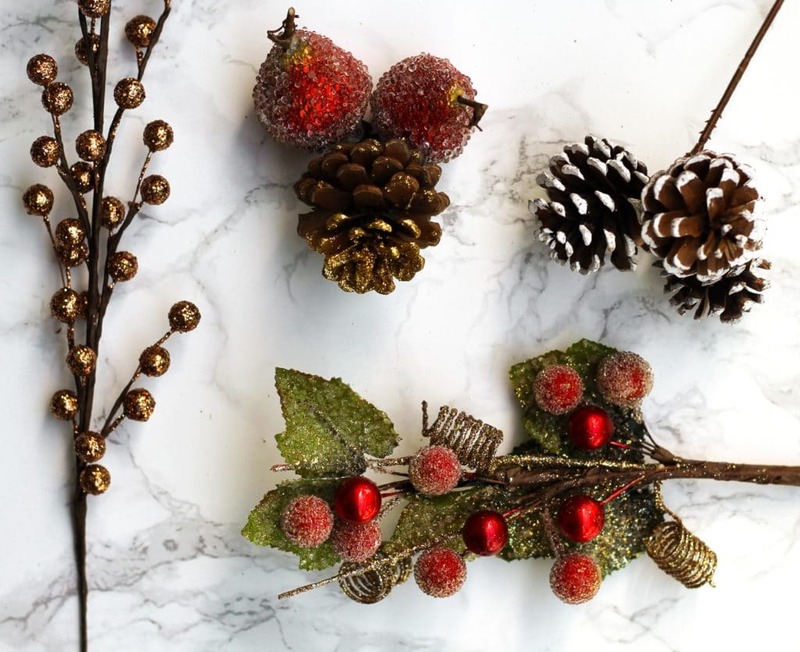 In my opinion, live plant ornaments artfully complement traditional Christmas ornaments, and I think they can be worked into any Holiday theme. 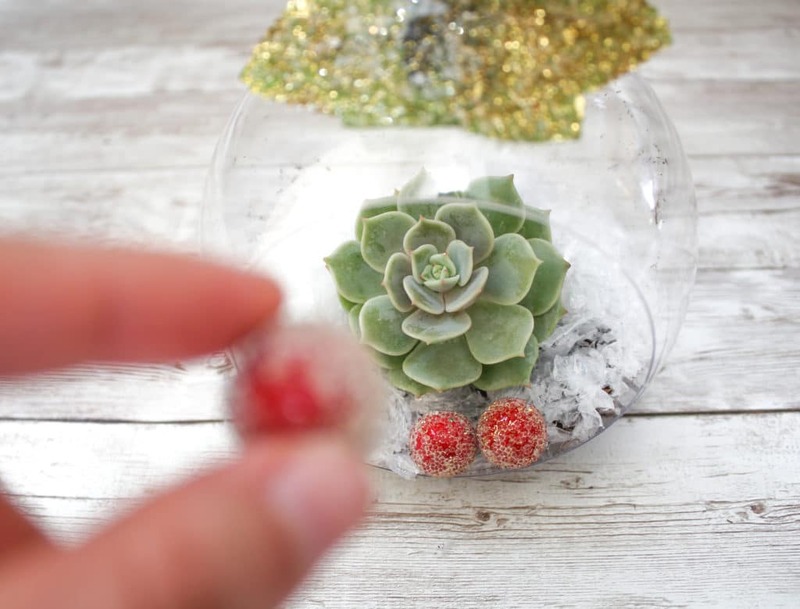 So if you’re passionate about plants, why not try adding a few succulents to clear baubles or terrarium ornaments this year?! 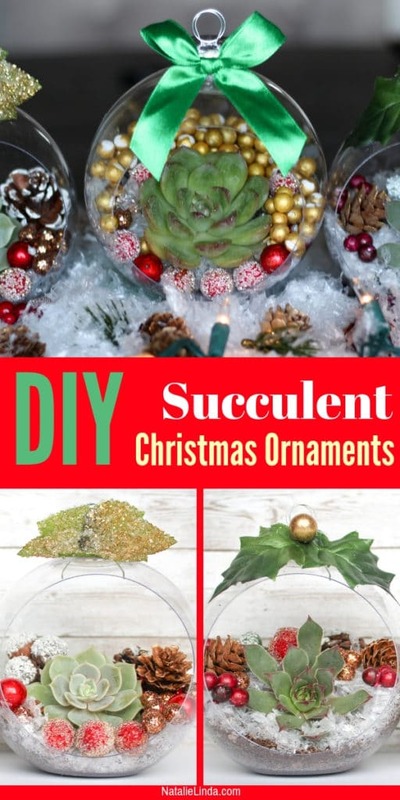 It’s a fun craft activity and an excellent way to utilize your succulents and incorporate your love of gardening into the Holidays. If you don’t have any succulents at your disposal, you can purchase them in 2-inch pots from your local garden center to make this craft; they’re usually about 3 dollars a piece. And don’t worry about wasting plants – if you think you’ll have to toss out your succulents once Christmas is over, think again. When it’s time to take down your Christmas tree, simply take the succulents out of the ornaments and replant them in cactus mix. They’ll readjust in no time. 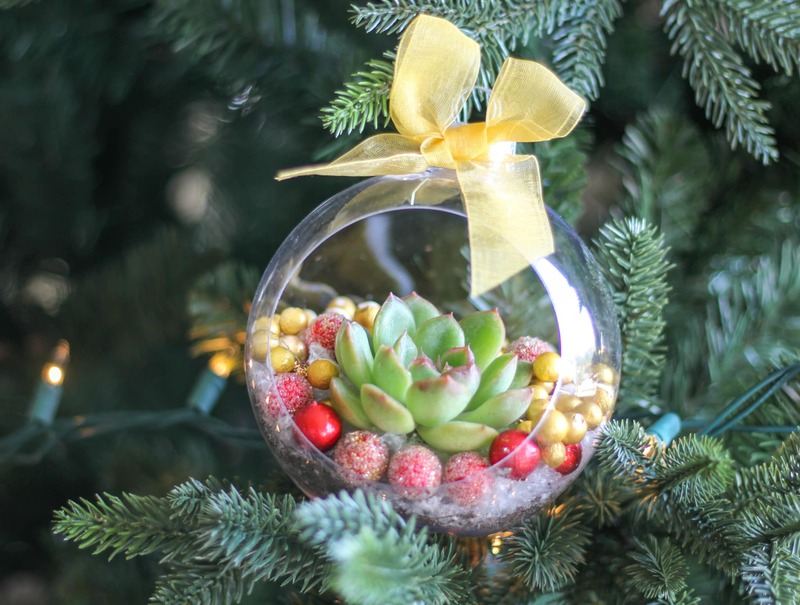 Succulents are hardy plants, so they’ll be fine inside of these ornaments for a few weeks, especially if your tree gets access to a few hours of sunlight each day. Once you replant them, they’ll begin to take root in their new home. (TIP: If your Christmas tree isn’t close to a window, simply take your ornaments off the tree during the day and place them in a sunny spot in the morning or early afternoon so they can get the sunlight they need. For more tips on how to care for succulents, head over to this post). 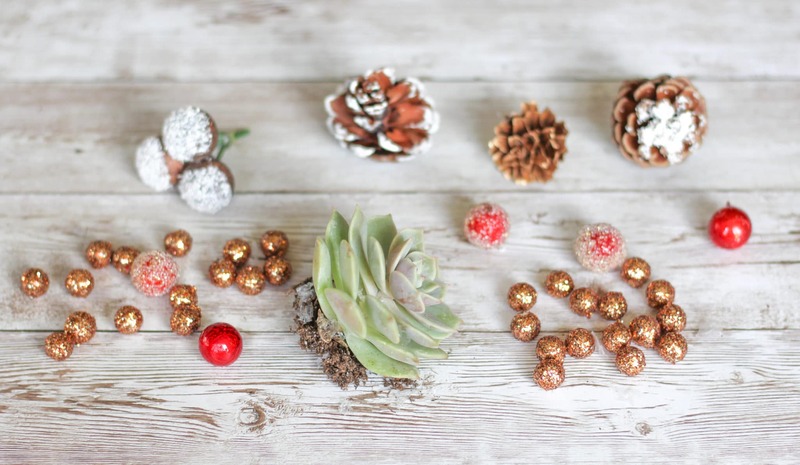 To make these succulent Christmas ornaments, I picked up a few Christmas decorations like pinecones and floral picks from my local craft store. You can get your supplies inexpensively at stores like Michaels, Hobby Lobby, or the Dollar Store. Amazon also has a ton of pretty options. You can also utilize your favorite decorations from years past, just don’t use anything that’s too heavy in weight because these ornaments will have to be supported by a tree branch. The first and most important thing you’ll need to do is pick out your succulents. Small compact succulents, like Echevarrias, are best for this craft. They look beautiful and they won’t hit the roof of your ornament. They’re also sturdy and easier to handle than cacti and other succulents. 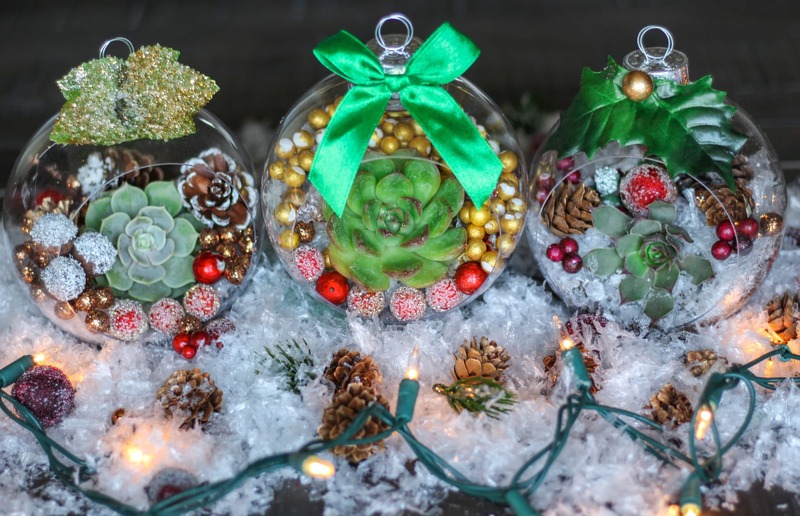 TIP: I watered my succulents a day before I made these Christmas ornaments because I wanted to make sure the roots were moist and the leaves had been filled up with enough water to help them last a few weeks inside these ornaments. Succulents are drought-tolerant and they store water in their leaves and stem, so watering beforehand will give the plants enough water to survive this project. (Read this post if you need a refresher on how to water succulents). 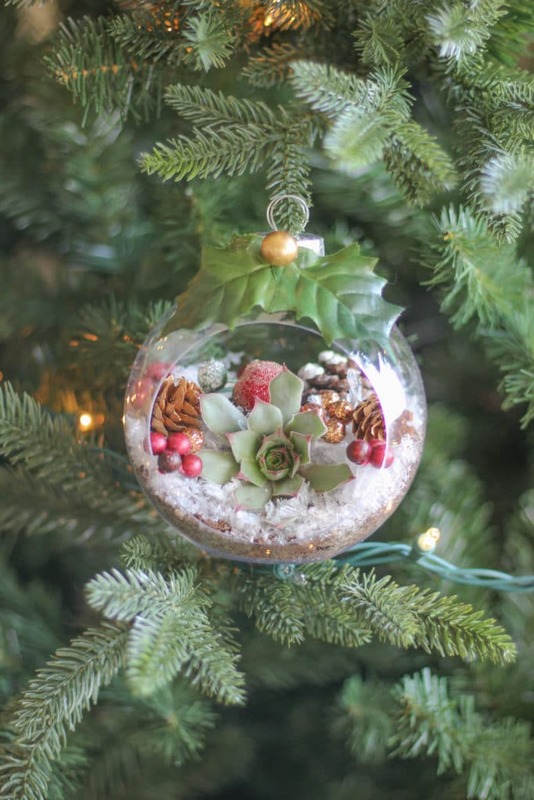 After picking out your succulents, remove most of the soil from the roots (as shown below) because you want to make sure the plant fits inside the ornament. You don’t have to remove all the soil, just enough so that the succulent fits in a compact space. You want to avoid having a large block of soil because this will make the ornament too heavy and not as visually appealing. Next, place a few spoonfuls of cactus mix inside the ornament. When you’ve added the soil, the next step is to cover the soil with artificial snow, as shown below. The snow adds a ‘Winter Wonderland’ element to the ornaments that really gives it that lovely Christmas effect. You can skip this step if you’re going for a full-on earthy look. Now it’s time to add your succulent. With your hand, make a small hole in the center to make room for the succulent just as you would if you were planting it inside a pot of soil. 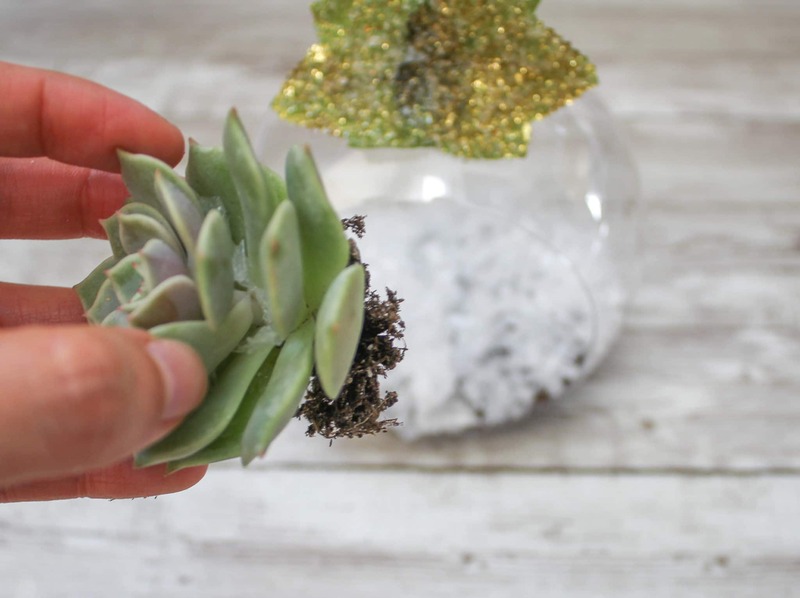 Push the face of the succulent forward so that it’s facing the opening of the ornament, then carefully add soil and snow around the succulent to secure it in place. Next, add any little decorations on top of the snow and around the succulent. Make sure whatever you add complements the succulents and doesn’t overwhelm it. The plant should be the center focus! 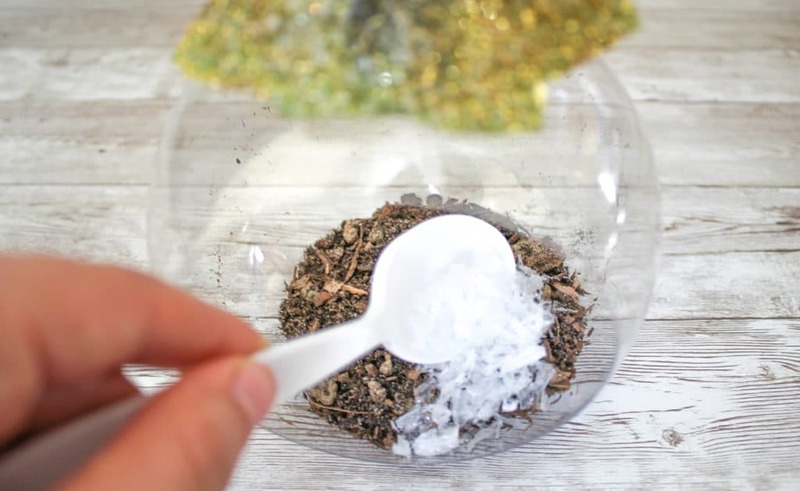 This step is the most time-consuming but it’s also what will make your ornament shine. It’s what will add that beloved Chrismas look to this craft, so be patient and make sure you’re satisfied with where you’ve placed things. I found that placing a few larger beads in the front opening of the ornament helped to keep the snow from spilling out, plus it’s also what looked the best. For extra support, you can use a hot glue gun to glue the ornament cap to the ornament, since your ornament might be a little heavy. I also glued some ribbon and floral leaves onto the cap, for a touch of festivity. It’s all in the details, after all! Watering your succulents before doing this craft goes a long way in helping to keep them healthy. 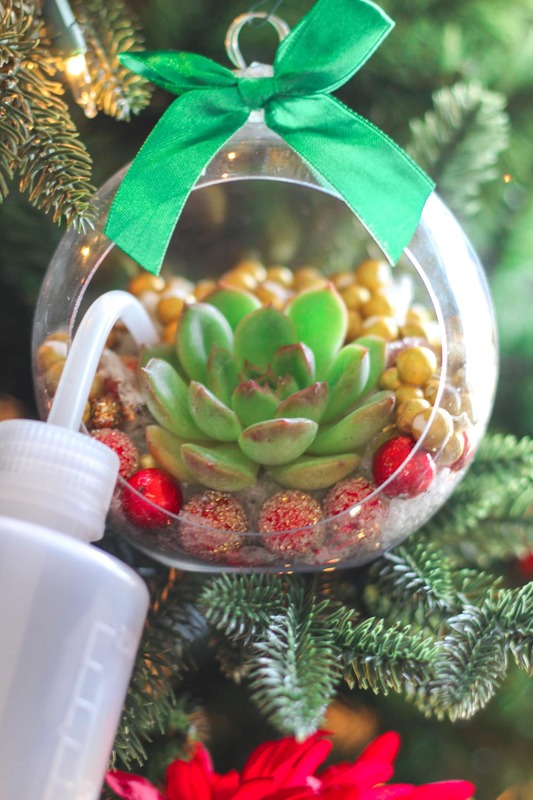 You can water your succulent ornaments weekly using a small watering can or a watering squeeze bottle. Make sure to stick the water directly into the soil and try to avoid wetting your decorations – a small amount of water is key; just a quick squeeze of your watering bottle will do! When it’s time to take your Christmas tree down, take your succulent plant out of the ornament and plant it in a pot filled with cactus mix. Then follow the care guidelines in my How to Care for Succulents post! Get Your FREE Garden Printables! Subscribe to my newsletter and get access to my FREE Resource Library that's full of gardening printables, growing cheat sheets, garden planners, and more!